The Lord gives darshan in bridal attire. Kavala Maharishi had 360 daughters. The Lord made all 360 maidens into one maiden and kept her on His lap. As per sthalapurana, the Lord married one maiden a day and married all 360 daughters of the Maharishi in a year and hence called Nitya Kalyana Perumal. The Lord has Lakshmi on His left side and hence the Kshetra is called Edavendai (Edam - left). 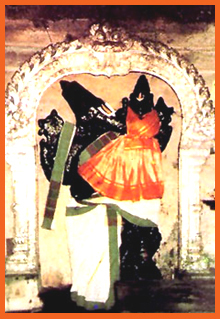 Theertham - Kalyana Theertham, Varaha Theertham. Thirumangaialwar - 1021, 1108-1117, 2673 (73), 2674 (119) . Located along the beach-way of Chennai-Mahabalipuram Highway. Well Serviced by bus network. The Perumal of this Sthalam is Lakshmi Varaha Perumal. He is found in standing position facing his thirumugham towards East direction. Prakthyaksham for Markandeyar. . This sthalam is situated in Tamil Nadu near Mahabalipuram. By travelling around 40 Kms from Chennai, we can reach this sthalam. From Mahabalipuram its is 5 miles along the sea shore.